You are here: Home / Can your income tax debts be discharged in bankruptcy? Frequently when asking a client if they owe the IRS or Maine Revenue they will confess they owe for a number of years, sometimes many years, followed by “…but I know income taxes are not dischargeable in bankruptcy.” A sigh usually bookends this statement. So the question is: can my income tax debts be discharged in bankruptcy? Truth is: yes you can! Taxes are indeed dischargeable in bankruptcy! Now certain rules have to be followed but if you qualify you may be able to discharge your tax debts, including any associated interest and penalties. This post isn’t long enough to go into all the nuances but let me at least explain the basics. No attempted evasion by the taxpayer to avoid or defeat the tax (the No-Tax Evasion Rule). Fail any one requirement and you are out of luck. No ands, ifs or buts. 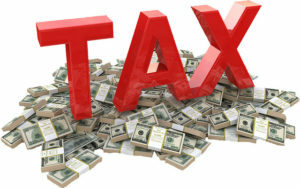 That doesn’t mean you cannot deal with your taxes through a bankruptcy as there are other tools in the bankruptcy attorney’s arsenal to address your tax debts but it does make it much harder. So it is in your best interest to file your taxes on time even if you cannot pay your taxes! Interest that accrues pre-petition generally follows the tax meaning that if the tax is dischargeable than so is the interest. If the tax debt is non-dischargeable than interest will still accrue post-petition so if you have a non-dischargeable tax debt you need to watch out for this. Tax penalties on the other hand have their own rules. If either the tax to which the penalty applies is dischargeable or three years have passed since the event giving rise to the penalty than the penalty is dischargeable. Depending on the penalty, this can be a substantial sum of money. Watch out for tax liens! If the IRS or Maine Revenue has filed a tax lien against you, the tax itself may be dischargeable but the tax lien may survive bankruptcy depending on the situation. A tax lien that passes through bankruptcy unaffected if there is value in your assets. This means that after your discharge the IRS or Maine Revenue may later seek to recover the value of its lien out of your assets even though personally you do not owe the tax. A reason to consult with a knowledgeable tax professional if you have substantial tax debts and are considering bankruptcy! This all sounds good but I heard bankruptcy can [insert objection here]?! You may be asking yourself, Attorney Wade this all sound so good but will I lose all my assets?! Is bankruptcy going to ruin my credit? Will everyone find out I had to file bankruptcy? Will the sky fall down on my head?! Bankruptcy has its pros or cons and I don’t encourage clients to file bankruptcy lightly. I liken filing bankruptcy like yoga – it is supposed to be good not only for your mind but body. I would only recommend filing bankruptcy if it was better overall to file rather than not. So rest assured that if I am suggesting you file bankruptcy that I have thought of bankruptcy overall and its impact on your situation. Contact a Maine tax attorney today and find out what bankruptcy can do to resolve your tax debts! So if you owe the IRS and Maine Revenue and you cannot pay your taxes than maybe bankruptcy is a possible solution. Discharging taxes in bankruptcy is a complicated subject so you should speak with a knowledgeable tax attorney before filing. Call me at 207-747-5318 or contact me today and schedule an appointment for me to review you situation and see if bankruptcy could provide you with a fresh start!